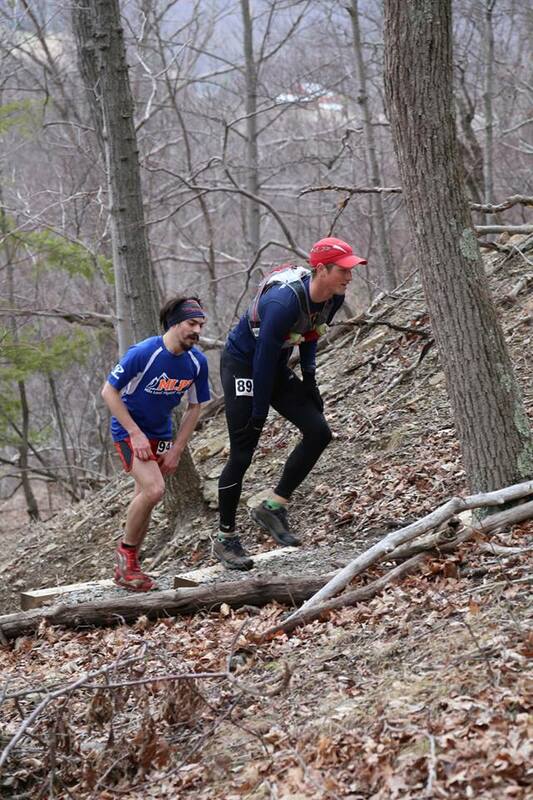 We went in search of mud at our second race of the year, the Dirty Kiln trail race. Well, maybe we weren’t actually actively searching it out, but that is what we received (plus just a wee bit of water). We ran this race last year and decided to give it another go this year. 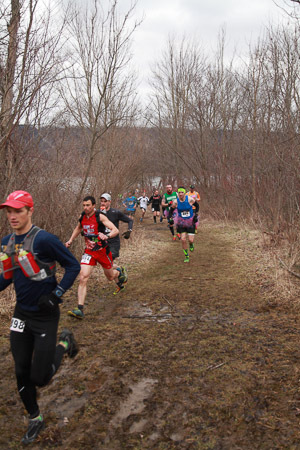 The course was fairly muddy last year and given the rain that had fallen the week before the race, I figured it would be at least as muddy this year. 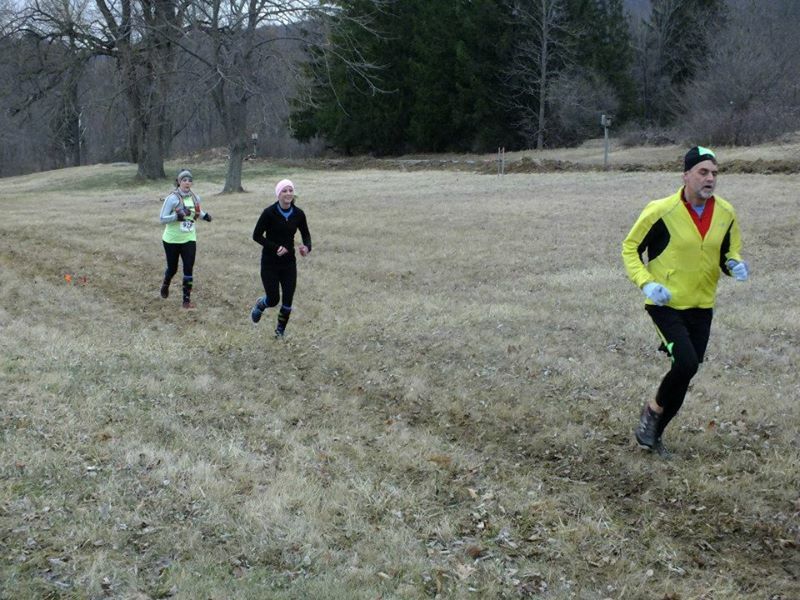 The Dirty Kiln trail race is outside of the group of races that make up the Central PA trophy series (info on that series here) and is put on by Allegheny Trailrunners, but it is still part of the overall Trailrunner Trophy Series (info here). They have two options, a 5 mile and a half marathon. 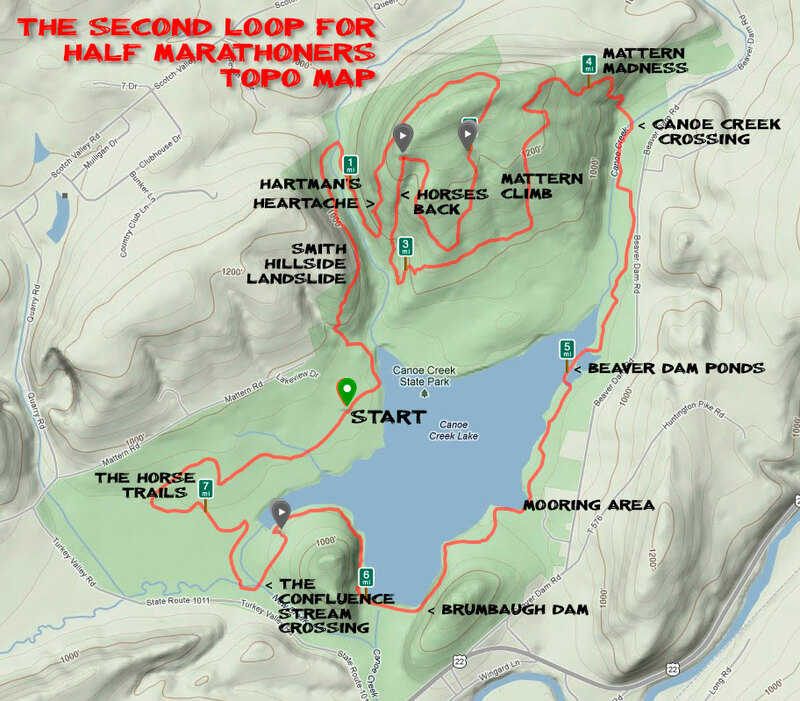 Each race runs the same 5 mile loop and the half marathon makes up the rest of the distance with another loop that runs a bunch of the same route, but adds a longer section in the hilly area, plus a little detour at the end (see map below). In my hasty pre-race prep looking at the maps and elevation profiles in the car and worrying about making it to the start in time, I didn’t have time to notice the little jaunt for the second loop at the very end. I obviously didn’t remember this little nugget of information from last year, but I think it will stick with me now. Both of the loops circle the lake. The first loop really only has one hill, which you get out of the way at the beginning. The second loop adds a bit more elevation change and then ends up back on the 5 mile loop. I, not surprisingly, chose to run the half marathon. Sprinting for 5 miles sounded horrible; I would much rather run longer, but slower. Christy chose to run the 5 mile race. Last year, both races started at the same time (9:00), which ended up being a little bit odd because you had no idea what race people were running until you completed the first lap. This year, the half started at 9:00 and the 5 mile at 9:15, which simplified things for me (but maybe not so much for Christy). Weather, weather, weather. For some reason, I was blinded by the nice weather the week before and didn’t really think that it might actually be a bit chilly come race day. 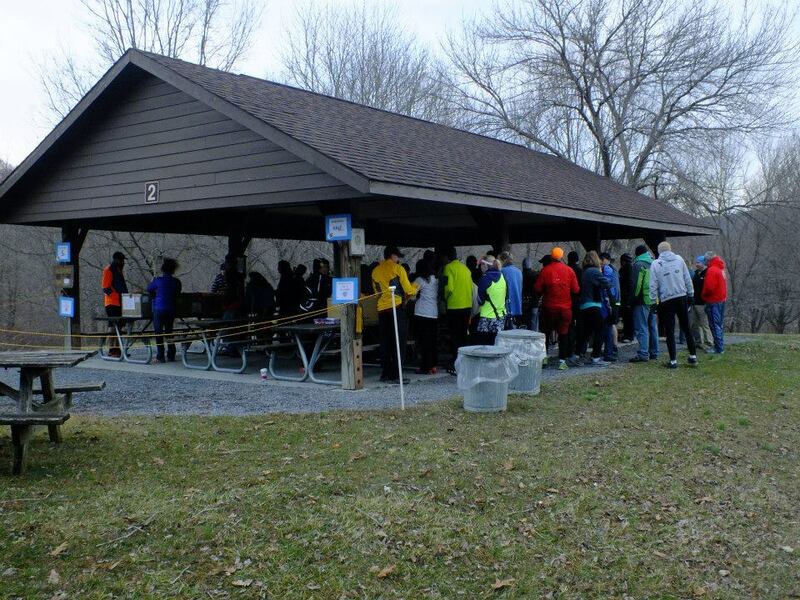 We arrived with about 40 minutes before the start and went over to the covered pavilion that served as race HQ and grabbed our packet, bib, and chip. These chips had a band that went around your ankle. I bounced around a bit in line trying to stay warm, and then we dashed back to the car to get changed and get ready for the start. 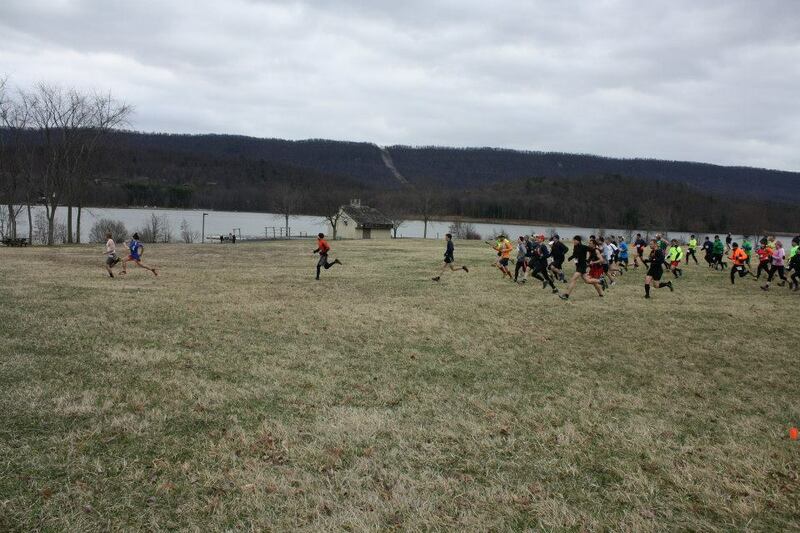 I ate an energy bar and then we went to the grassy field that served as the starting line. Adam came over and said “hi” by the start line, and we chatted for a bit as we waited to start. I looked at him in amazement and his choice of race clothes: sleeveless shirt and shorts. I meanwhile had pretty put on every layer I had brought (I hadn’t brought a coat) since I was freezing. To each his own. I unlike Adam, was not that worried about overheating. Even then I was chilled, and I tried to steel myself for the cold creek crossings I knew were coming. He gestured to my race vest and pointed out that I had decided to carry some water this time (as compared to mile run). I had decided the water and places to shove gels and trash would be nice and I barely notice when I am running with it, so I figured “why not?” The air horn blared, and I watched a couple of runners speed away across the field. 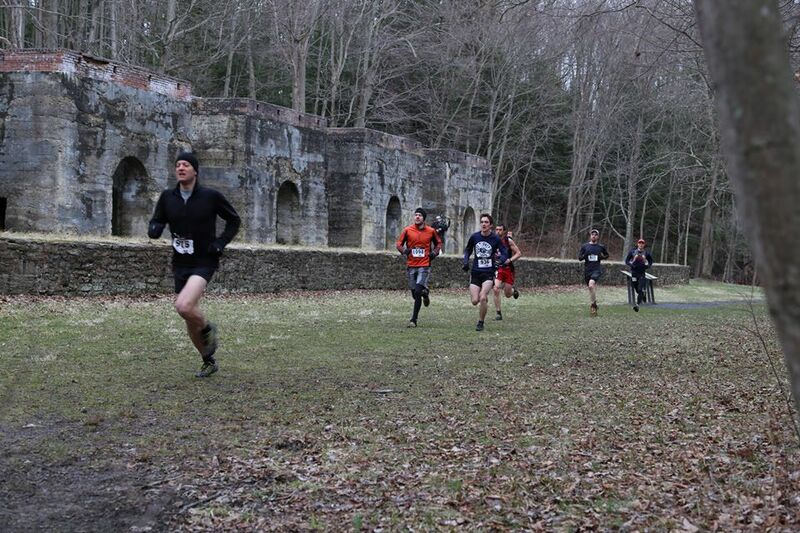 We ran through some squishy muck and I could tell this was going to be a soggy race. Being at the front (and running the half) came with some small benefits because we were the first racers through the muck and it therefore hadn’t been torn up yet. One of the 5 mile runners, who happened to be from Stuckey Subaru (one of the sponsors), captured the start of the 5 mile race with a GoPro. 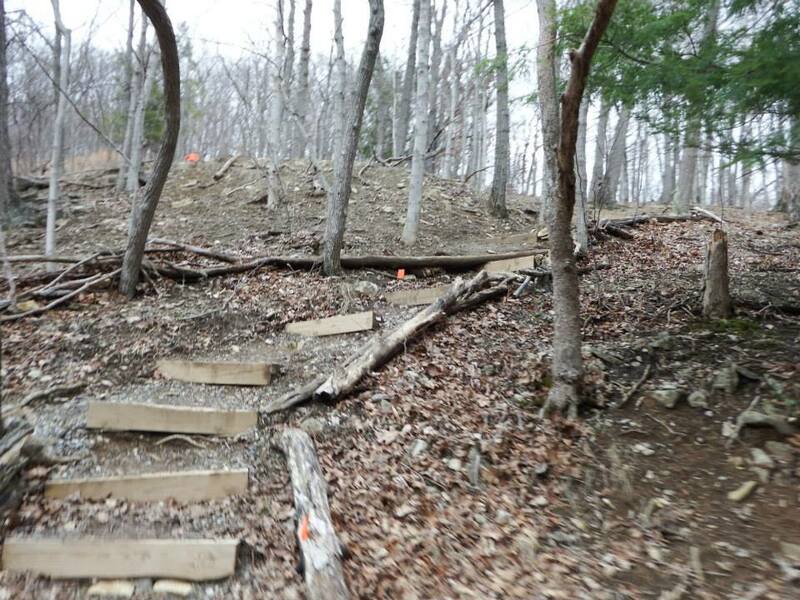 Since we longer-race runners covered the same loop, with some of trails run twice, I will try to sprinkle in some of those videos so you can see what the course looks like (clearly, if you care). This video covers just about until the start of the first hill. Be forewarned: everything is bouncy – the whole frame, plus all the runners. I actually find it a bit hypnotizing. As I hiked/ran up the first hill, I quickly caught up to one of the Allegheny Trailrunner guys, Elmo (or Justin, nicknames/names confuse me). I ended up running around him for the rest of the race. 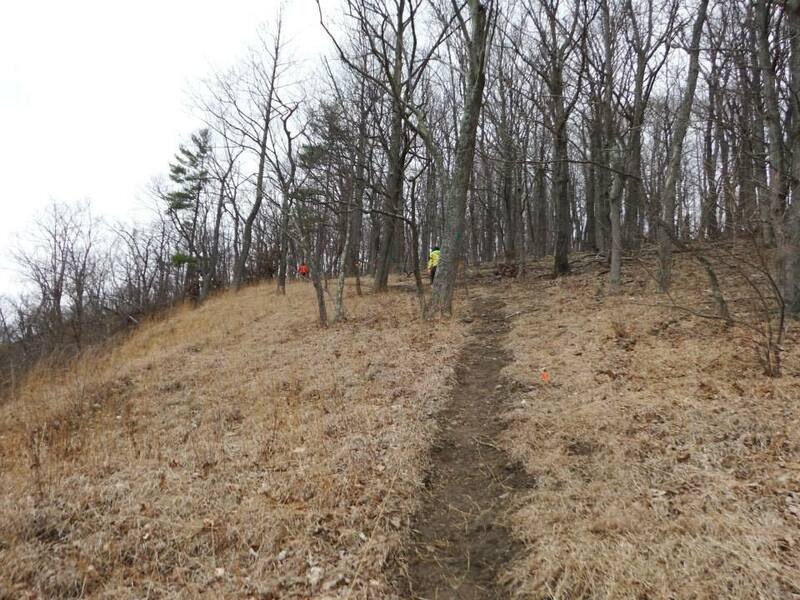 The hill started as mostly runnable, but then had some fairly steep sections towards the top, and I soon found myself doing the trail runner hike uphill. Wind cut across the top of the hill and went right through my tech-fabric layers. By the time I crested the hill, it was just myself and Justin. After that first hill, I had a long downhill to look forward to. The trail was thankfully dry going both up and down on the hill (because it actually drained). While it wasn’t that rocky, the footing was still a bit loose and I found myself bouncing back and forth to each edge of the trail to get the best footing and to bank the turns as much as possible where it was steep. I mainly followed Justin’s bounding strides downhill. We cruised through some muddy flats, and then shortly after we finished off the downhill, we reached the first creek crossing. I had sort of figured it was going to be the case, but I was still surprised at the height of the water. We had about 25-30 feet of stream to cross, which was more than the true stream width because we crossed diagonally. I had no desire to power through the water, splashing myself and probably wasting energy, so I instead power hiked the crossing and felt the cold water rise to my knee. There was a small muddy bank to climb up before I could get back on dry and level ground. I was a bit concerned about cramping when I used different muscles climbing out of the stream, and, in particular, muscles that had just been submerged in frigid water. Here is the GoPro video of the crossing. I think these are all 5 miler runners, which makes it a LITTLE bit better that this guy was taking a dip in the stream. If I had done this, especially on my first loop, I probably would have either turned around and headed back up the hill to get the blood flowing before warming up in the car or curled into a ball and waited for the onset of hypothermia. Crawling up and out of the stream, I was reminded why wearing tights was both a good and a bad idea. On one hand, they had kept me warm so far. On the other hand, they attacked my calves with cold after I had thoroughly soaked them. Fortunately, my legs started to warm up as I followed the Beaver Pond trail. 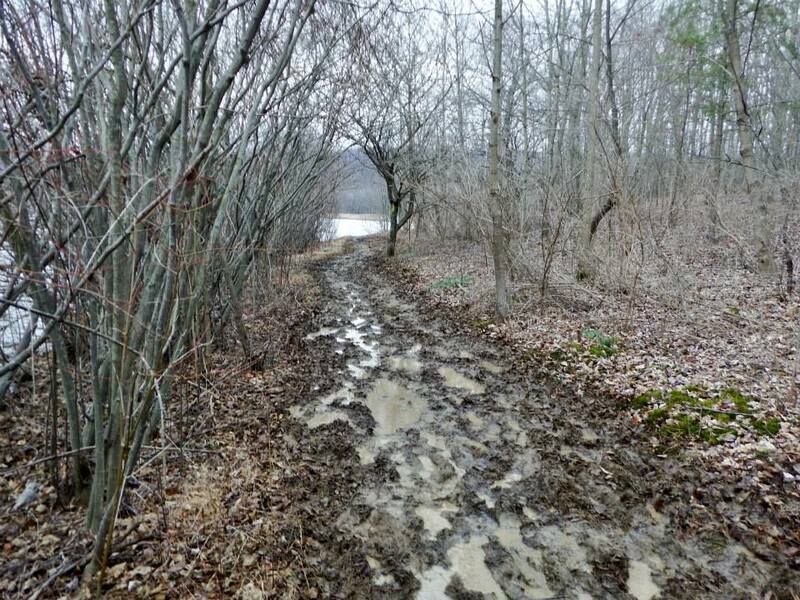 This section of trail ran through some low brush (still not green) and featured some mud and standing water. I saw no point in avoiding the puddles given that I had just submerged my feet in water. If they are wet, they are wet. The course led us out onto what was essentially a grassy dike that cut through the lake, creating a pond to our left. It wasn’t as picturesque as it would have been on a nice, sunny day, but I certainly enjoyed looking around and taking in the odd feeling that we were running on a grassy trail that wound its way through the lake. We came off the trail and ran by the boat launch area. For some odd reason, we ran straight through the grassy middle of a loop of road. I really wanted to run on the road because the squishy grass made for utterly garbage footing. But, I obediently followed the flags. 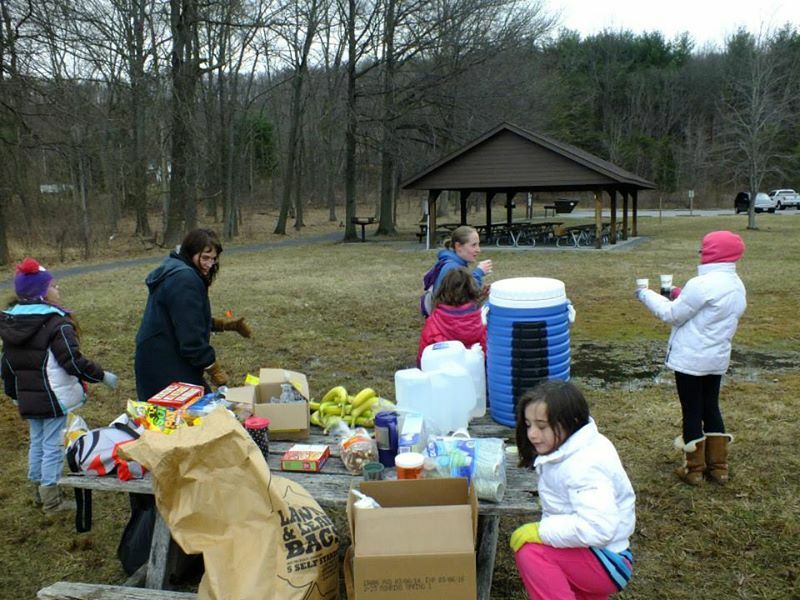 Some cheerful girl scouts staffed the aid station that was near the edge of the lake. However, I had all the water and food I could need in my race vest, so I tried to cheerfully wave “hi” to them as I otherwise heartlessly ran by. Sorry I didn’t stop! The next bit of trail was some of the muddiest yet. I was pleasantly surprised that although a lot of it looked bad, it wasn’t the sole-sucking mud that I feared. The last thing I wanted was to have my shoe slip off, embedded in the mud. 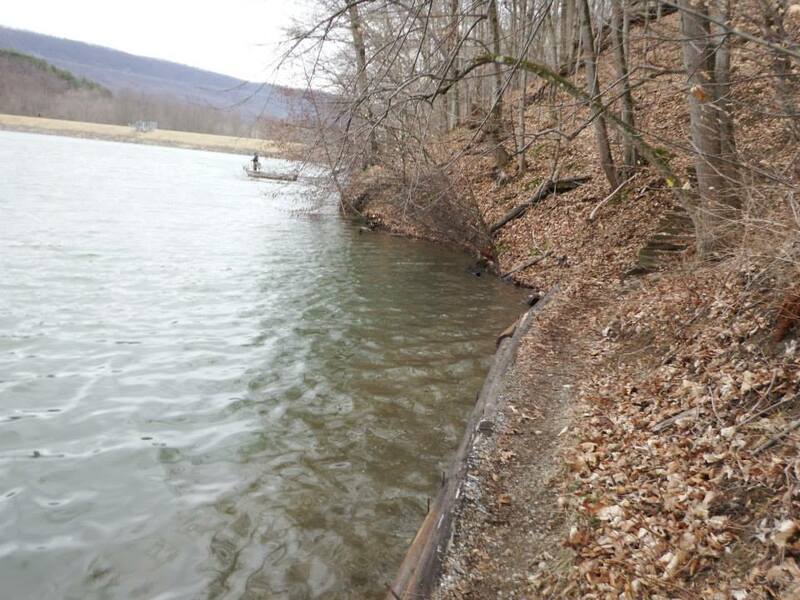 We ran across the dam, which made for easy running since it was just gravel on top. I made a note of my time when I reached the end of the dam so that I could figure out how long it took me to reach the finish, which I could then use on the second lap to pace. That act would end up being pretty much useless because of the little extra bit that was added at the end on the second loop. Coming off the dam, I slowed down as I went up a tiny uphill and entered the Roller Coaster. This was a quick and fun section of ups and downs that ran right along the lake. There were a small set of stairs that I tried to fly down while not stumbling and shooting out into the lake. There were some guys fishing the shoreline from a boat, so I tried to avoid tripping and stumbling at any point into the lake and forever marring the reputation of all trailrunners. Any unintentional cannonball might also scare away the fish.Following the roller coaster, we went briefly uphill on a squishy trail (I think there is a theme here) before descending a wide and mushy (and you guessed it, muddy!) trail to one of the race’s feature attractions, the second stream crossing! Now this one was truly deep. As I rapidly approached the crossing I noticed that A) there were a bunch of people standing near/in the stream, presumable to help me and B) there was a rope across the river. I told myself, “Eh, I’ll be fine.” The water buffeting my legs caught me a bit off guard as I crossed and I actually leaned into the rope. 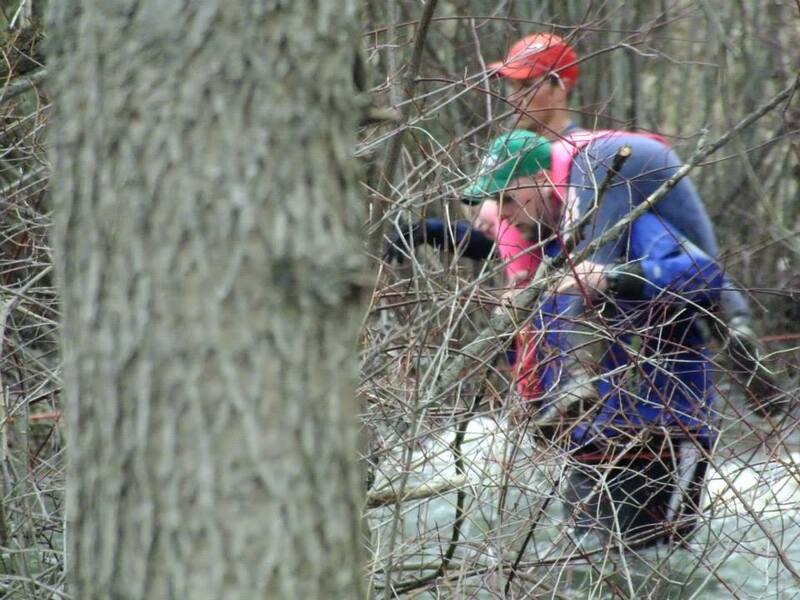 Luckily, my end goal wasn’t to climb up on dry land, but rather was to reach the outstretched hand of the volunteer on the far bank and have him pull me out of the stream. That guy was very much appreciated! 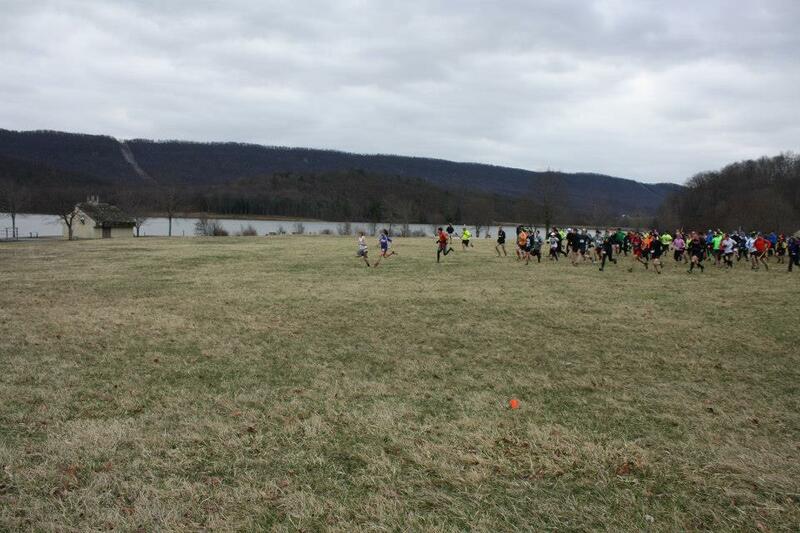 We circled back around to the start and ran across the grassy field. I was just playing follow the leader at this point. I still had no idea where anybody else was in front of me. I’ll skip a lot of the details for the second loop since it had a lot in common with the first loop. On the first loop, we hadn’t actually climbed all the way to the top of the hill, but this time we did, hiking a bunch of the way. As you can see from the race profile at the beginning of the post, we ran down and climbed up several times. 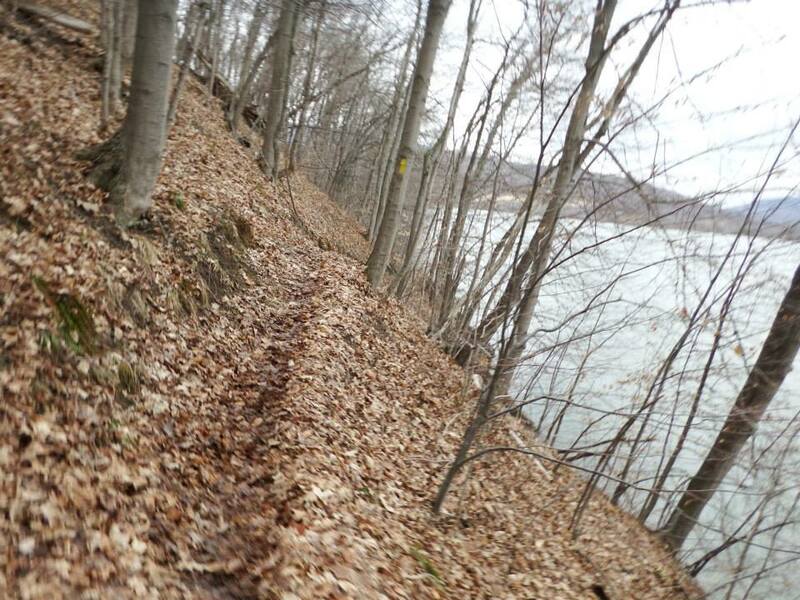 On the downhills, I definitely found myself tracking to the edges of the trail to find the best footing. Some of the route here followed grassy road cuts. I tried to count down the hills, but I didn’t have much luck given that I didn’t actually remember what the profile looked like much less how many hills I had to climb. After the up and downs, we linked up with the first loop and went through the first stream crossing again. Once more, I did not stop at the aid station, but just waved to the young volunteers. I know, shame on me. Justin was a little bit behind me, but not at all far enough I could feel easy. In the muddy section just before the dam, I surprisingly found myself passing one of the guys I hadn’t seen since the start. I started running across the dam and saw another runner just entering the Roller Coaster. I then realized that it was time to play chase. I tried to run hard and cut down the distance between us as I ran along the lake. Just before the second stream crossing, I started to pass some other runners that were either doing the 5 mile or were at the tail end of the half marathon runners. This mainly mattered because coming down to the second stream crossing, I could see from a distance the half marathon runner in front of me crossing. However, just as I was approaching the stream, I saw a guy with a young girl slung across his back like a sack of potatoes just getting ready to cross (I guess she didn’t want to swim). Shoot, I thought, I don’t want to end up stuck behind this guy in the stream and lose my chance to pass the guy in front. I made a snap decision and started to cross the stream about 10 feet upstream of him (and the rope), before cutting down to the rope. I was extremely glad that actually worked and I didn’t end up tripping and swimming. 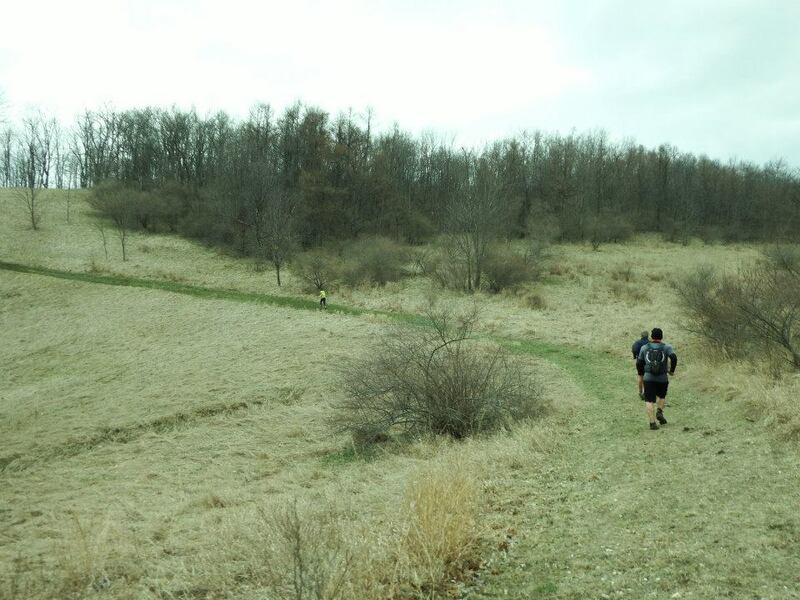 Once again, I grabbed the outstretched hand of the volunteer and I was off with a “Go get ‘em.” I soon realized that all of the attention I had paid to how long it had taken me to reach the finish from various waypoints while running the first loop was useless. We weren’t following the same route back to the finish, instead going on a little jaunt off to the left. I slowly caught up to the runner I had been trying to pass, chatted with him for a little bit, and then moved on. While running with him, he remarked (friendlily) that I had come out of nowhere to pass him. If he had continually checked over his shoulder, he might have realized that I was catching him at what felt like a snail’s pace. 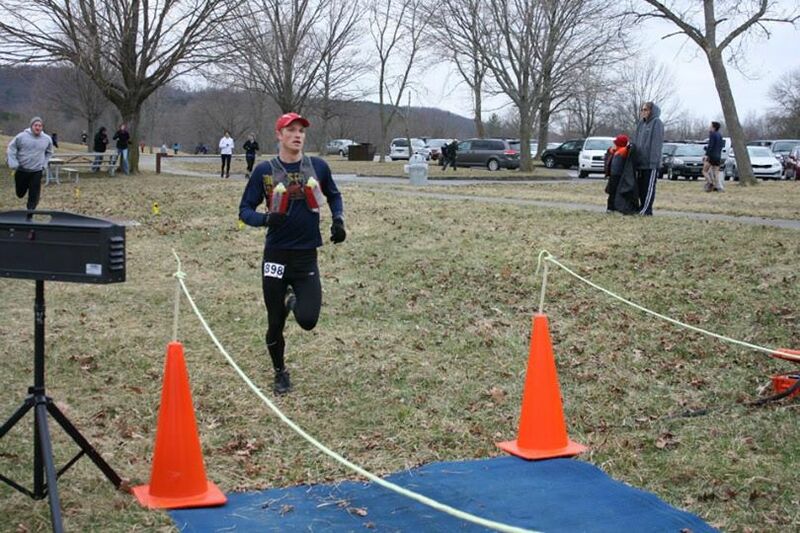 Thankfully, I was able to keep a strong pace through the finish and didn’t have to worry about a sprint to the end. After I finished, I briefly chatted with Adam and watched a few other runners finish before grabbing a couple handfuls of food and heading off to get changed. I wasn’t that muddy since the last stream crossing had rinsed it all away, but I wasn’t clean (or warm). My original plan was to take a shower to warm up and then hang around for the awards ceremony. But…the water was barely warm (if at all) in the showers, so straight back to the car I went. Here is where I whine. 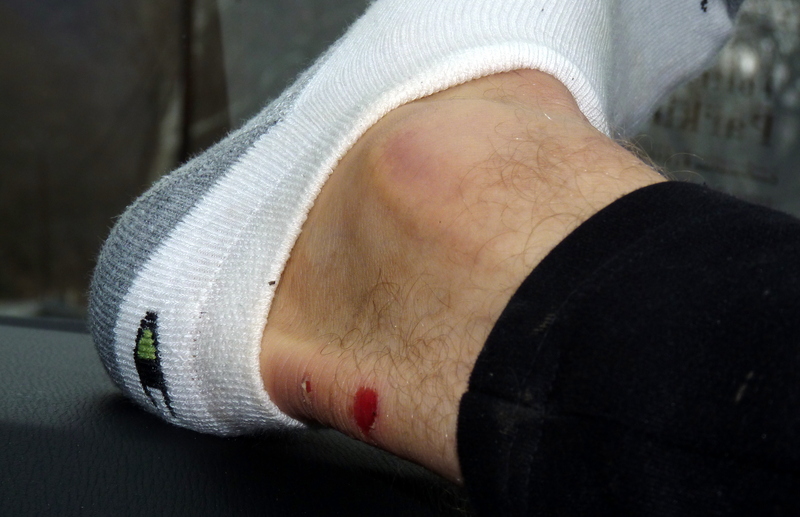 Putting on my socks, I discovered that the race chip around my ankle had managed to tear a hole in my skin. Picking up the chips earlier in the morning, I had told Christy that these kind of chips annoyed me because I didn’t like having things on my ankles. Well, this race had upped that annoyance to hatred. Thank goodness, I can look forward to the bib-style chips for the PA Trophy series races. Oh, woe is me. Stupid chip. This entry was posted in Race Reports and tagged Dirty kiln, race report, trail race, trail running, Trailrunner, trophy series. Bookmark the permalink.